There are some nice articles about setting up this feature in SQL Azure. But in both of the articles I couldn’t find anything about the usage of views, so I tried it out myself. I will go on with the article on ppolyzos.com, so I assume you will have a Db1Table in Db1 and a Db2Table in Db2, where the Db2Table is available as an EXTERNAL TABLE from Db1. But what if you have 2 tables in Db2 you want to query in Db1? 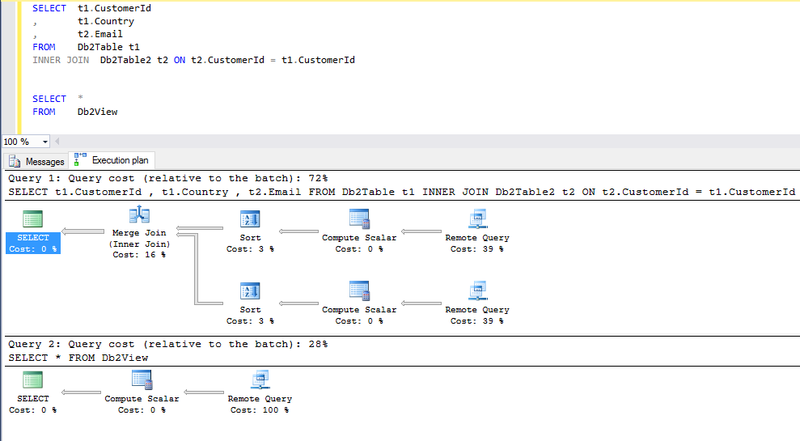 You could simply add a new EXTERNAL TABLE in Db1and execute a query. One thing to note is the external table, doesn’t have to include all the columns from the source table, in this example I’m not using the Gender field in the EXTERNAL TABLE. But what if we want to get the Country and the Email in Db1? But what about performance? What if we create a VIEW to get the data and make an EXTERNAL TABLE from the view. Let’s create the view in Db2. And create an EXTERNAL TABLE in Db1 for the VIEW. apparently this works, so now we can query the db2 View in db1. Now let’s have a look at performance between querying the external view and the external tables in Db1. Here are the execution plans for both queries. So I guess it’s good to know you can create EXTERNAL TABLES for both VIEWS and TABLES.